Posted April 19, 2015 by firstame Uncategorized. The ACC organised a 7-day coaching course for national coaches from Asia, Africa and Europe in Lahore from October 20 to 27, 2002. The course was conducted by Bob Woolmer, High Performance Manager, ICC.Lt. Gen. Tauqir Zia, chairman Pakistan Cricket Board, inaugurated the course in a high profile ceremony on October 21. Mr. Andrew Eade, Development Manager, ICC, specially flew to Lahore for this function. The theory sessions of the course was held in Hotel Avari while the practical sessions were scheduled at Gaddafi Stadium, Lahore with the active cooperation of Pakistan Cricket Board and its officials. All the coaches were given specific assignments. Their aptitude and ability to communicate was tested by Bob Woolmer in practical training sessions during the net sessions. All coaches will be graded on the basis of their performance during the practical sessions. 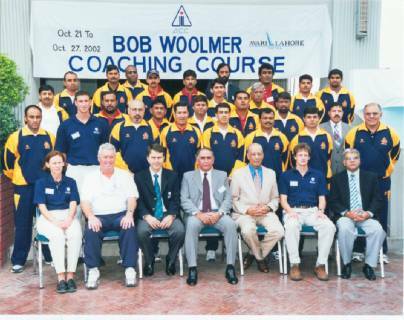 The certificate awarding ceremony of Bob Woolmer coaching course was held on October 27, 2002 with Mr. Ehsan Mani, president-elect, ICC as guest of honour. During the ceremony Bob Woolmer presented a detailed report about the course. He urged upon the participants to take pride in their profession and advised them to develop structural strength in cricket operations in their respective countries through honesty and dedication. Mr. Ehsan Mani said he was pleased with the way the Development Programme in Asia was now progressing. He eulogised the outstanding work being done by Mr. Zakir Hussain Syed, Development Manager, Asia and his staff. In particular, he praised the originality and far reaching impact of the Development Programme which had been highly commended by the ICC. In his speech, Mr. Ehsan Mani pointed out that the organisation of this course in Pakistan showed that it was a safe country and therefore foreign teams should not have any reservations about visiting Pakistan. He also awarded certificates to the participants of the course. Dr. Vece Paes from India, Mr. Tom Tikolo from Kenya, Mr. Nazmul Abedeen from Bangladesh and Mr. Haroon Rashid from Pakistan expressed their views on behalf of the participants. Mr. Zakir Hussain Syed, Development Manager Asia, thanked Mr. Bob Woolmer and his associates for the excellent work done by them. He made a special mention of Dr. Vece Paes and Roger Binny from India in this course and hoped that their presence would mark the beginning of new era in reopening cricketing relations between India and Pakistan. Dr. Sheryl Caldr, Mr. Grant Compton and Mr. Clinton Gahweiler helped Bob Woolmer in conducting this course as specialists in various fields. The course received widespread publicity on television and print media.